Everyone loves receiving something 'just for you'. It creates an instant connection and feels extra special, so it's no surprise that businesses are increasingly trying to personalise their customer's product experiences as well. Augmented reality is one of the best ways to provide personalisation to your customers, which has made 'design your own' apps extremely popular. Indeed, 24 per cent of customers said the implementation of AR in-store would make them more likely to visit the shop again, according to a study by the Centre for Retail Research (CRR). On average, they also said they would spend an extra 17.5 minutes and £15.90 in-store per visit. Here's just why customers love personalised AR experiences. The problem with customised products is that you can't see what they look like before you buy, as they haven't been made yet - unless you implement AR, that is. This technology allows businesses to create an app that enables a consumer to customise a pair of trainers, for example, and then see what they'd look like on their feet. 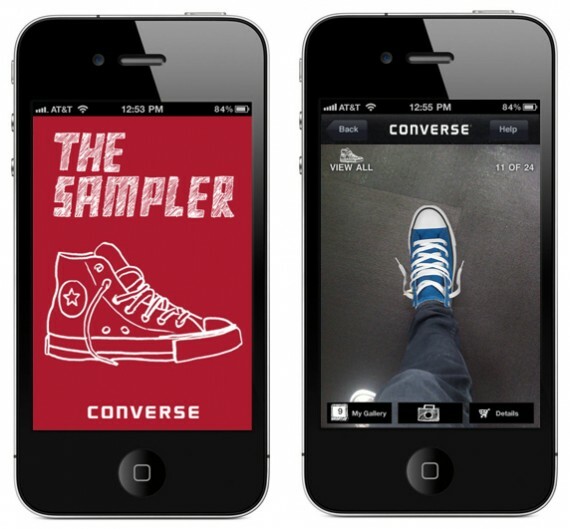 Converse's 'The Sampler' app did just that; customers could even share the image of their virtual shoes on social media. Giving consumers the ability to try before they buy increases their likelihood to make a purchase, as they know what the product looks like and whether it suits them. This also reduces the chance of them not liking the product on arrival and returning it. Customised products can prove difficult and costly to return; refunds are also time-consuming. 'Design your own' AR apps make consumers more confident about the product they are buying - confidence that also reflects upon the business itself. The popularity of these types of apps is proven too - the augmented reality app for Ikea's 2014 product catalogue has received more than 8.5 million downloads to date! If the customer can't see the product in person, they need to visualise it in their own home, or on their person. When buying a new home that hasn't even been built yet, it can be difficult to communicate your personal preferences, and imagine what it will look like when complete. We designed an AR app for Weston Homes PLC, which allowed potential homebuyers to see a 3D model of the property they could purchase. They were then able to select the furnishings and fittings they wanted, basing the decisions on more than just guesswork. This type of product experience is much more interactive than simply looking at concept art or a miniature model of the building. Plus, the consumer feels as if they are building their own home, and are therefore much more likely to feel attached to it, thus making the emotional connection that persuades them to buy. No matter what you're purchasing, shopping can often be a passive experience. Take buying a new car, for example. Yes, you can look at the different models on offer, climb inside and test drive what's on offer, but how do you get a consumer interested in a car that isn't in the showroom? AR can help. In 2011, Volkswagen implemented AR in its showrooms, by creating a special app and installing it on salespeople's iPads. To bring up a 3D, to-scale model of their latest vehicle, all the user had to do was point the iPad at a marker point on the showroom floor. The customer could then see the car from all angles and customise certain aspects, such as the body colour and rim styling. This type of product experience can dramatically increase dwell times, as the customer will want to take time building a vehicle with their exact specifications. Consumers love free stuff; they love it even more so if it's something they can personalise. Such content is great for brands too, as it's an easy way to increase awareness and customer loyalty. Starbucks' 'Cup Magic' campaign is an example of how free, personalised AR experiences can do wonders for your campaign. The coffee maker created an AR app especially for Valentine's Day. Customers could scan their themed cup with their smartphone to create a unique message for a loved one, then bring the cup to life. Participants could send this message to their partners and even attach a Starbucks' voucher. As a result of the AR initiative, Starbucks saw 26 million mobile transactions in 2012, and $110.5 million was reloaded to Starbucks' cards via the mobile app. Personalised content works, something which more and more marketers are starting to realise. More than half (52 per cent) of marketers agree that giving consumers the chance to personalise content is "fundamental to online strategy", according to Econsultancy research. New technology is exciting to consumers - they love gadgets, and they love innovation. Additionally, marketers are always looking for new ways to catch the attention of their target audience. Some products, however, have been on the market for so long that no one really bothers to innovate them any more. Greetings cards are a good example - it's an industry worth £1.29 billion, and yet it has not changed much. Nonetheless, some companies have started using AR to grab the attention of consumers that want something a bit different, and don't see the value in what is essentially a piece of card that will be thrown away in a week's time. As part of a Kickstarter project, one company created greetings cards containing personalised 3D video messages. All the receiver had to do to see their message is download an app and point their smartphone at the card - the robot on the front would then come to life and wish them a happy birthday, happy Valentine's Day, or a happy holiday. With AR, old experiences can become new ones, and the impersonal can become something that's 'just for you'. If you'd like to learn more about AR and the product experiences we've created, check out some of our work, drop us a line here, or call 023 8184 9811 to talk to us direct.